During this season of Advent this year, we have read texts that get louder and louder with prophetic messages of what is to come. This is the thing of which Christmas’s are made. This passage actually depicts the second part of a story about an encounter between the prophet that we know as Isaiah and the Judean King Ahaz. It locates the story in 734-733 bce, when the Kings of Israel and Aram attempted to invade Jerusalem and replace Ahaz with a sort of puppet ruler who would support their coalition against Assyria. The invasion was actually unsuccessful but at this point in the writing, that ending is unknown. The attacks threaten not only the survival of the nation itself but the fulfillment of a promised ruler descended from David, the great King of history. So, the prophet Isaiah is sent to reassure Ahaz of divine protection. Now, it is apparent that Ahaz is a ruler of faith—so much so that he will not ask as others have done for a “sign”, proof of God’s promises. And so God gives him one anyway, proof that God is always and forever God, even in the face of one with strong and faithful convictions. The sign is a child. The child’s name, Immanuel (or “God with us”) reinforces the divine promise to deliver the nation from its enemies and sure demise. The child is born of a young woman, the Hebrew “almah”, which means a young woman of marriageable age. If the author had wanted to depict the woman as a virgin, the word “betulah” would have been used. But in the Greek translation of the Old Testament, the word was translated as “parthenos” or “virgin”. So the writer of The Gospel According to Matthew understood the verse as a prediction of the birth of Jesus. And then all those translators that came after that capitalized on that notion, perhaps in an effort to explain the unexplainable, to rid the text of the ambiguities that were probably meant to be there in the first place. Many scholars think that the young woman may have been Ahaz’s wife and her son the future king Hezekiah. She also is identified with the wife of the prophet himself. But, regardless, the very birth of a child could have evoked hope in a time of great despair and national duress. And, likewise, our interpretation through our Christian lens interprets the passage as a promise of redemption that we see through the birth of Christ, Emmanuel, “God with us”. This text is, as we said, ambiguous at best. Who are we kidding? The whole faith story is a little ambiguous at best. Maybe it’s supposed to be that way. But the promise of this child (whoever the child is interpreted to be) is one of hope and promise, one of joy and peace, but it can also be one of fear and apprehension. After all, what does it mean for God to be with us, walking among us, being a part of our very lives? How do we respond to the idea of God’s very real presence in our lives? And how do we truly respond to the idea of full transformation of all that is into what it should be? The details of the story no longer matter. The point is that God is With Us. And so, we are called to trust God and put our faith in the promise that God brings. Ahaz, the Assyrians, everything around will soon fall by the wayside, but God’s promise will remain. After all, God is with us. But what that means will be something for you to discover on your own. a. What are your thoughts about this passage? b. What does that truly mean to live with the real presence of Christ in one’s midst? c. So what expectation in this Advent season does this passage evoke for you? This is a short text but it’s definitely packed with some pretty important ideas: being set apart, the Good News of God through Christ, the Scriptural witness, Jesus as a son of David, Paul’s mission to the Gentiles, and faith itself. Essentially, it has to do with identity. Paul sees himself as a servant of Christ; literally, a “slave”, one who submits totally to God, one who belongs to God. The original hearers of this message did indeed belong to God through Christ but they were also a part of the Roman Empire. But over and above who they are as Romans, Paul reminds them that first and foremost, they belong to Christ. Paul himself cannot turn his back completely on his own identity and the culture in which he grew and still resides. And he is not expecting that from anyone else. But he is calling his hearers to an awareness of something more, something beyond who they are. Perhaps this is Paul’s way of reminding us that God enters our lives through the normalcy of what life holds. We are not called to change the lives we live, just the way we live them. We are reminded to live with an obedience of faith in the midst of who we are as people. Earlier this week, I baptized a baby who was eating a Ritz cracker. Now, we don’t usually pass out hor’dourves with the Sacraments, but, really, did that change God’s Presence in that moment? For that matter, who’s to say that it didn’t make that Presence more real? God’s presence and God’s promise comes wherever one is. Our calling is to respond to that presence also in the midst of the lives we lead. But that entails learning to see and listen in a way that many of us do not. We need to appreciate how God called others into being so that we might be able to better discern our own unique way that God is entering our lives. b. How would you describe your own identity? c. What does that mean for you to be aware of God’s presence in the “normalcy” of your identity and your life? The text is familiar. It is the story of stories. This is it; this is how it happened; this is how God entered the world and changed us forever. The writer of Matthew must have had such a great sense of God in the writings of Isaiah that this was the way it needed to be described. We already know the answer; we know what will happen. The Christ child will again come and for a moment, if only for a moment, we will look into the eyes of hope and change. We will look into the eyes of God. And then something will distract us and the moment will be lost—until next year. And yet, we are reminded of Emmanuel, God With Us. And, like Joseph, when we awake from sleep, we are to take the Christ child into our hearts. We skip over the genealogy. I supposed that’s done so that we can get to the story and not be bogged down in the details. I mean, really, most people don’t want to hear a list of names. It doesn’t make good press or good script. And yet, the story itself is buried in the details, isn’t it? I suppose God could come into the world with no help from us, with no help from all of those faithful ones who came before us. But what would it mean? Why bother? After all, the name of the Christ child is “God With US”. Doesn’t that mean something? The story is incomplete without us. Because without us, God never would have come at all. God came as Emmanuel, “God with us”, and calls us into the story. The Incarnation is the mingling of God with humanity. There’s no way out. The Divine has poured into our midst and we are changed forever. We just have to birth the Godchild in our lives. Knowing that we could never become Divine, the Divine became us. The world is turned upside down. And so God stayed around to show us how to live in it. So I suppose the writer of Matthew is right: All this DID take place to fulfill what has been spoken by the Lord through the prophets…and his dwelling will be glorious. We also are guilty of sort of skipping over Joseph. After all, can you imagine what he must have been going through? This was not just affecting Mary’s life. It was affecting his life too. The proper (and probably the easiest) thing would be to quietly divorce her and go on with his life. But in the night in a wild fit of sleep came the dream. Ah, the dream! “Listen to her, Joseph, she is telling the truth. And she needs you. This child will need you. He will need a father in his life to show him how to grow up, to show him how to become a man. He will need someone to hold him when he is afraid and scold him when he gets off course as all children do. He really just needs someone to love him into being. And Mary? She is scared. She needs you. 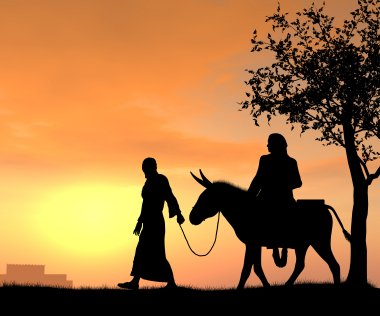 You can do this together.” And, so Joseph awoke, took Mary in his arms, and the rest is part of the story. But their lives changed forever. The Season of Advent is about waiting and preparation. But in the midst of the tree-trimming and the gift-buying and the cookie-baking, remember to look for the moment when you feel the presence of God in your midst. It will change you forever. b. What does the idea of God being with you really mean for you? c. What can we do to prepare ourselves for the coming of God into the world so that THIS TIME we know that it’s forever? The time is almost here. In just a few hours, the door to the Divine will swing open and God and all of heaven will burst into the world. If you stop and listen, just for a moment, you can hear the eternal harps in the distance as they approach our lives. Oh, sure, it’s happened before. But can’t you feel it? Doors opening, light flooding in, the earth filled with a new vision of peace eternal. Maybe, just maybe, tonight will be different. The child in the manger is, of course, no ordinary child, but God Incarnate, the Word made flesh. God took the form of a human–just an ordinary human–a human like you and me–and was born and dwelt with us–still Divine, but in every way human (because you see God in all of God’s wisdom and all of God’s mystery can do that!) This Holy Incarnation was not meant to show us how to be Divine but, rather, how to be human. We see ourselves as “only human”, as if that excuses us from being who God called us to be. But the point is that God calls us to be human, made in the image of God (not like God, but in the image–a reflection of God, Incarnate). Jesus the Christ was born human so that we would know what being human means. And when, like Jesus, we become fully human, our hearts are filled with compassion, connecting us to one another; our eyes are filled with a vision of what God made this world to be; and our lives become holy as they are shaped in the image of God Incarnate. And we, even as humans, can reach out and touch the Divine now that God has burst forth into this world. On the eve of Christ’s birth, let us open our lives to receive this holy child and open our hearts and our eyes that we might finally know what we are called to become–human, made in the image of God, a reflection and an incarnation of God here on earth. This Christmas, let Christ be born in us. This Christmas, let us become fully human. The time is almost here. The door is opening and we see heaven beginning to pour in. Go forth and become human, become who God called you to be.